Good, right? Now consider that doughnut made with gourmet ingredients like creme de cassis, stuffed with fresh fruit or topped with chocolate pearls. 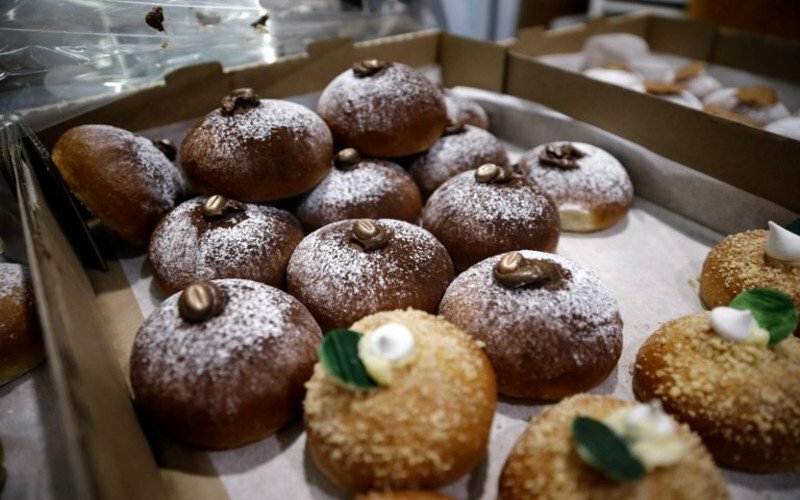 “Not only do we use the best products, but we have a secret,” said Yitzhak Kadosh, chef at his family’s Jerusalem cafe Kadosh, known for its high-quality sufganiyot at Hanukkah time. They run from seven shekels (US$1.90, 1.65 euros) for the classic doughnut filled with strawberry jam to 16 shekels for the more sophisticated. “We offer light doughnuts that allow several to be eaten — real pastries with a French touch that Israelis appreciate,” said Samantha Assuli, the store manager and wife of Chef Franck. Some even offer vegan donuts, while others have gone in a completely different direction with cheese or meat.